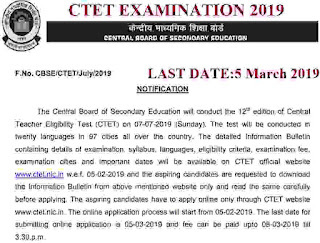 The Central Board of Secondary Education will conduct the 12th edition of Central Teacher Eligibility Test (CTET) on 07-07-2019 (Sunday). The test will be conducted in twenty languages in 97 cities all over the country. The detailed Information Announcement holding details of CTET examination, syllabus, languages, eligibility criteria, examination fee, examination cities and important dates will be available on CTET official website www.ctet.nic.in w.e.f. 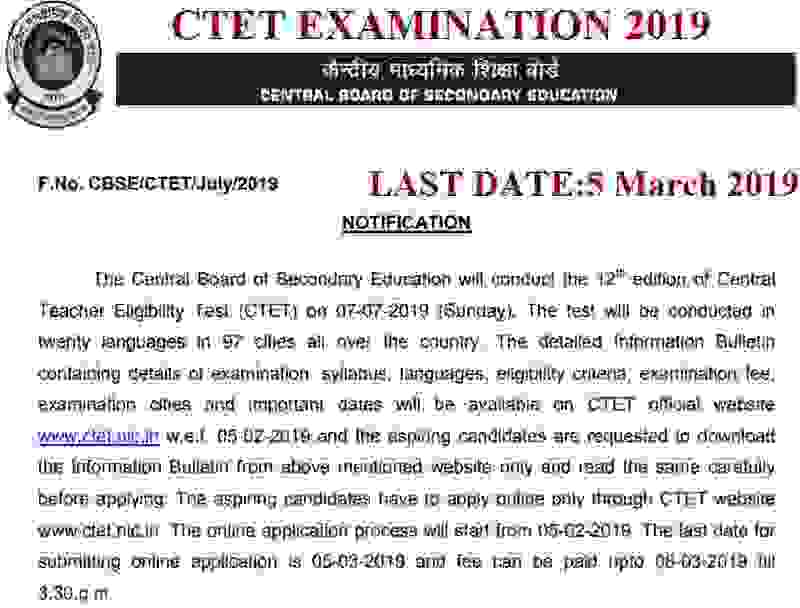 05th Feb. 2019 and the ambitious applicants are requested to download the Information Bulletin from above mentioned website only and read the same carefully before applying For the CTET Exam July 2019. The ambitious applicants have to apply online only through CTET official website www.ctet.nic.in. The CTET Exam online application process will start from 05-02-2019. The last date for submitting online application is 05-03-2019 and fee can be paid upto 08-03-2019 till 3.30.p.m. Entrance Exam Name: CTET Exam July 2019. Nationality: All Indian candidates can apply for this examination. i) Should read out the complete Information Bulletin carefully whose link given under IMPORTANT LINK section at the last of the article. ii) Should satisfy the suitability criteria to appear in the CTET Examination 2019.
iv) If a candidate submits on-line more than one application, his/her candidature shall be liable to be cancelled and the candidate may also be debarred for future examination(s). No communication will be sent in this regard. Educational Criteria: To know about the complete educational conditions for applying Click on the following link: Complete Educational Criteria for CTET Exam 2019. STEP1: You have to Log on into the CTET official website whose link is: “www.ctet.nic.in”. STEP2: After that on Home page you will find a Link, you have to Go to the link “Apply Online” and open the same. STEP3: Fill in the Online CTET Application Form and note down your Registration No./Application No. STEP4: You need to upload your scanned Images of latest Photograph and Signature in the online CTET Application form. STEP5: you can pay the CTET Examination Fee by e-challan or debit/credit card.